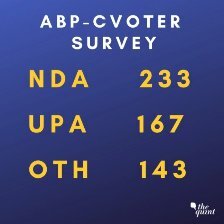 ABP-CVoter have come out with their latest ‘mood of the nation’ survey which predicts that there will be a hung parliament post the 2019 elections with regional parties playing kingmaker. According to the survey, the NDA will go down to 233 seats with BJP alone getting 203, the UPA will get 167 seats with Congress getting 109 and the others (not part of either grouping) will get 143 seats. According to the survey, the only way the NDA can form the government will be by getting the support of the YSRCP, BJD, MNF and TRS in which case its tally is expected to reach 278 (the majority mark being 273). But knowing Modi, he will not try to form the government with such a wafer thin majority and be at the mercy of others. The NDA and the BJP are set to lose out heavily in UP and Maharashtra. While in UP, after the alliance between the SP and the BSP, the NDA is set to 24 seats (the SP-BSP alliance is set to win 51), in Maharashtra, the NDA is likely to get only 16 seats and the UPA 28. Despite recent losses in Rajasthan, Madhya Pradesh and Chhattisgarh, the NDA is not likely to lose many seats in these states, once again proving the fact that people vote differently in assembly and Lok Sabha elections. The survey highlighted the fact that at 25%, anger against the Modi government is at its peak in 5 years. It also showed that consolidation of Hindu votes through politics of polarization is not working in UP in the face of the SP-BSP alliance and Dalits and the backward classes are no longer going to vote for the BJP. It also showed that the Citizenship Bill has harmed BJP prospects in the North-East. Although most of the political parties pooh-pooh these surveys, most of them will now study it deeply and try to put in place strategies to gain voter confidence. The BJP, for one, is either going to play on the upper caste EWS quota in UP to further consolidate the Hindu vote or Amit Shah might once again go on a Dalit outreach abhiyaan which was a huge success before the last assembly elections. Or the party can do both simultaneously to minimize the loss of seats. The Congress has already started strategizing before the survey was made public. It has strengthened its bases in UP by inducting Priyanka while deciding to fight alone on all 80 seats. It has also decided to go it alone in Andhra and Bengal. The Congress strategy is clear – they want to project Rahul Gandhi as the PM if they win and will have nothing to do with any party that does not support this. The results of this survey will not make any difference to the party bent on making Rahul the PM. One is sure that if the survey was conducted a week or ten days after it became known that there would be no mahagathbandhan of opposition parties and that most seats will witness three or four-cornered contests, the results would have been different. Voters would have changed their preferences if they knew that most of the opposition parties are not on the same page. If the opposition is not united, one thinks that the NDA will romp home with a simple majority because a fractured opposition will gift it more than 50 seats. Will NDA Return With Majority?